The sound of flowing water is one of the most effective stress relievers out there. 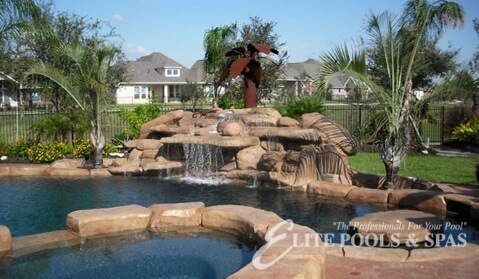 When you own a pool, you’ve got relaxation at your fingertips. Stress can impact our mental and physical health in a number of ways causing headaches, depression, high blood pressure, and stomach aches just to name a few. Yet no matter the toll stress can take on our bodies, we still put ourselves in stressful situations, because let’s face it, sometimes it’s unavoidable. When you feel the stress level rising, take advantage of the stress-free zone that is in your backyard. Don’t have time for a swim? No need to worry. Just sitting by the pool for a few minutes and listening to one of your water features or the water slapping the sides of the tile are sure to calm your heart. Even if it’s raining outside, take a seat under your patio or open a window so you can listen to the rain fall into the pool. The soothing sounds of water are sure to change your mood and reduce your stress. Find ways to incorporate a few minutes at the pool’s edge during the week, even if it is only five and notice the difference in your mood directly after.